The Nomad will be on display from February 24th through the 26th and you should come down and see it for sure! 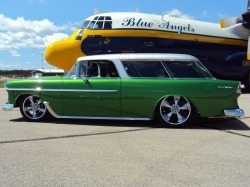 On June 29th we attended a mini car show at the US Coast Guard Air Station in Traverse City. It was a great day for everyone. We saw the Blue Angels on site. Come join the festivities at the 2010 National Cherry Festival in Traverse City, Michigan as we lead the Michigan State Spartan's Alumni Band in the DTE Energy Cherry Royale Parade. Sparty will be there too! The parade is on July 10, 2010 at 11:15 am. The 1955 Nomad was on display in the Hagerty Insurance showroom from 2/27 - 3/20/10 The showroom and Haggerty office is located at 141 Rivers Edge Drive in downtown Traverse City, MI.